Val's Quilting Studio : June OMG: Bee Happy! I want to continue to be intentional about using projects in my stash this year, so I'm tackling my Lori Holt's Bee Happy! applique blocks this month as my OMG. I want to make some obvious progress in getting more of these blocks done. I had purchased the kit with my last year's Piggy Bank Savings so I'd like to get it done before this year's Piggy Bank Challenge comes around again NEXT month already! I'm using the fuse applique method and machine stitching these with a blanket stitch, so they are fun and fast to finish. I only have 12 more blocks to make and think they'll be easy to get done during an afternoon movie on a hot summer afternoon. 1. Make a summer tablecloth for our patio table. 2. 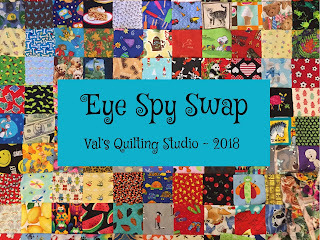 Finish a family size Eye-Spy quilt that will be gifted in August. 3. I have two quilts that need the binding sewn. 4. I'd also like to get my Anni Downs BOM finished...I'm sooo close! With all that said, it looks like I'll have many fun posts to share this month. So stay tuned! Hey Guys! What better way to collect 200/400 different Eye-Spy fabrics than by swapping with fellow blogger friends. Click HERE to read about our Eye Spy Swap and perhaps think about joining us. Your Summer sounds as if it is going to be fabulous, Val! Your Bee Happy quilt puts a smile on my face....it oozes fun! Good luck with the Bee Happy! Mine is ready to be quilted--hopefully soon. Happy Summer! Hi Val, just wondering if you got my sign up email. Ooh, I LOVE that Lori Holt sampler that you're working on! Good for you, taking up a new hobby with your sweetie. It sounds like you have a wonderful summer ahead of you. Good luck with all of your endeavors, both with and without fabric! Glad to see you are working on Bee Happy. I loved making my Bee Happy quilt and I blanket stitched mine too. Now I enjoy seeing it hanging up in the living room. Oh my hubby was a golfer his whole life. He was a scratch player and that was his business building and repairing golf clubs. He hasn't played in a few years now. Fun blocks. Thanks for linking up with Elm Street Quilts One Monthly Goal and good luck on your project! How many middle school photogs/bloggers will there be? If you can share their blog addresses, I'd be happy to take a peek and leave some comments. After all, comments are the very best part!! Hi Val. You sound charged and ready for a break from school as am I. I love your goals and hope you achieve them all. Bee Happy is so so so so happy and gorgeous! I am loving it!